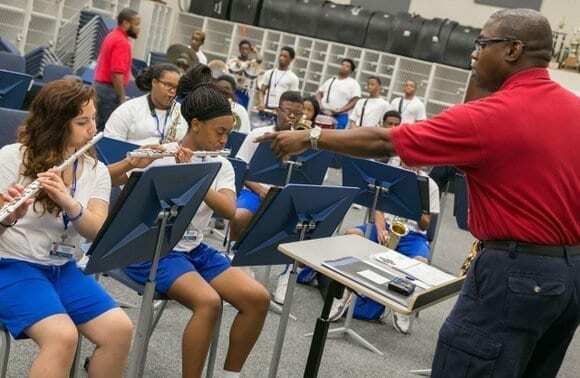 Dr. Reginald McDonald, director of Band at TSU, instructs students during the Edward S. Graves Summer Band Camp in 2015. 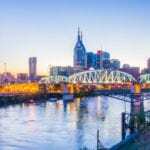 NASHVILLE, Tenn – Tennessee State University is the place to be for cool summer camps that provide youngsters and incoming college freshmen with real-world educational experience. The university is offering a variety of camps and programs intended to help participants learn something new, while also spending quality time with top-tier faculty, staff and students. Summer camp themes and subjects range from science, applied mathematics and engineering, to music, athletics, real-world scientific work, and cutting-edge research. Youngsters from 5 years on up will participate in early learning, musical and sports camps such as the TSU Women’s Basketball Kids Camp, the Offense Defense Sports Football Camp, and the Community Academy of Music and Arts Piano Camp, among others. Overall, more than 2,000 students are expected on the university’s main campus, and its Avon Williams Campus. They range from elementary to college freshmen, some of whom will come from as far away as California and Puerto Rico. One of the more popular camps is the Academic Boot Camp, a key recruitment tool for the university. Now in its sixth year, the four-week residential program gives incoming freshmen an early introduction to college life. Participants earn college credit toward their major. The camp offers an academic and college preparedness program, including introduction to college life, public speaking, workshops and technology. Physical and mental development exercises, such as self-discipline, respect for others, good study habits and how to succeed in life, are key components of the program. “The object of this program is to ensure that students who have already been admitted for the fall semester actually get a jump start on enrollment,” said Dr. John Cade, TSU’s interim associate vice president for Enrollment Management and Student Support Services. He said the retention rate for students who enter the university through the Academic Boot Camp is very high. “It is about 85 percent, which shows that the program has proven to do what it was designed to do. We have also found out that when those students actually return in the fall, they are better able to navigate the system, many of them become mentors for other students, and many get actively involved in extracurricular activities,” Cade said. Another camp favorite is the Summer Apprenticeship Program, or SAP, a science-based initiative for college freshmen and rising high school seniors that exposes them to cutting-edge research. Last year, 21 students from Tennessee, Mississippi, Florida, Indiana and Georgia spent five weeks engaged in studies from understanding the hypersensitive response of tobacco plants, to comparing DNAs in chickens and Guinea fowls. Their finished works were presented as scientific papers and research results to a standing-room only audience of parents, faculty and guests on TSU’s main campus. William F. Hayslett Sr., coordinator of the SAP, said the objective of the program is to dispel the “myth” that agriculture is farming. “Our goal here is to make students aware of the academic programs in the College of Agriculture, Human and Natural Sciences and the many career opportunities available to its graduates,” he said. Click here – for a list of all summer camps and programs and contacts.